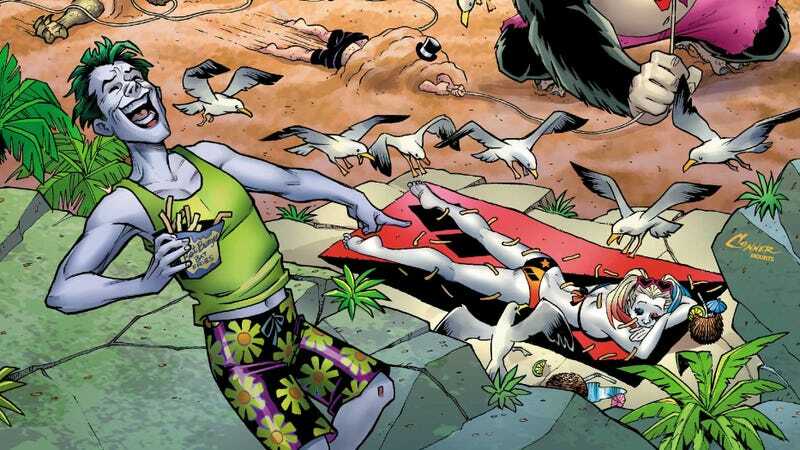 DC Comics has a huge roster of compelling villains who can carry stories without a superhero anchor, and this week’s Beach Blanket Bad Guys Summer Special gives 10 evildoers the spotlight in short stories by a fantastic line-up of creators. Lee Bermejo and Francesco Mattina pit the Joker versus Bizarro. Paul Dini and John Paul Leon give Mr. Freeze a giant mech to terrorize Gotham City. Gabriel Hardman and Corinna Bechko, the team behind Green Lantern: Earth One (one of The A.V. Club’s Best Comics of 2018), dive into the character of Black Manta. Lex Luthor, Giganta, Gorilla Grodd, Deathstroke, and the Crime Syndicate also get attention, giving readers an expansive look at DC’s evildoers. This exclusive preview of Beach Blanket Bad Guys Summer Special features two stories highlighting animal-themed villains: The Cheetah and The Penguin. The Cheetah’s tale features two alumni of DC’s Talent Development Workshop, writer Vita Ayala and artist Amancay Nahuelpan, crafting an emotional story that explores the complexity of Barbara Minerva’s relationship with Wonder Woman. They build on the work done in Greg Rucka’s most recent run on Wonder Woman, but the most exciting thing about this story is that it’s Nahuelpan’s DC debut, where he works with colorist June Chung to deliver lush jungle imagery and an imposing interpretation of the central villain. The Penguin gets the spotlight thanks to writer Daniel Kibblesmith (a former associate editor of our sister site Clickhole), artist Laura Braga, and colorist Arif Prianto, who bring a character from Batman: The Animated Series to DC Comics for the first time. Veronica Vreeland debuted as a love interest for The Penguin in “Birds Of A Feather”, and she fulfills a similar role in this comic, which embraces the summer theme more heavily than any of the other stories in this one-shot. Kibblesmith captures the isolation and paranoia that make Penguin a dangerous tragic figure, and moments of cartoonish exaggeration in the artwork reinforce its connection to the TV show. There’s a lot of talent in this one-shot, and these creators showcase what makes DC villains so engaging.